I think it’s fair to say we’ve never had weather so good in the UK! It’s definitely getting us outdoors more. Only problem is, how can you keep your kids entertained every day without mounting up the costs? Don’t worry, we’ve come up with a whole load of activities to help you entertain kids for the holidays. And because the weather’s so good, we’re bringing it all outdoors. Our outdoor activities are free or very inexpensive, making sure you don’t have bored kids on your hands, or an empty bank account. Been meaning to buy fence screening for your garden? Why not let your kids have a go at creating some for you? (Once they’ve finished using it as a wall for their secret hideaway, of course!) First, gather up long twigs and sticks. Make sure you have thick sticks or branches for the fence supports. The ‘fence supports’ will need cutting down to roughly 70cm long. Next, find the ideal location for the twig fence, and hammer in the supports roughly 30cm apart. Careful of fingers and thumbs! Now get your kids to weave the first long thin twig in and out between the fence supports. Once woven in, push towards the base. Keep repeating the weaving and pushing until you reach the top. Make sure the kids alternate the weave each time. 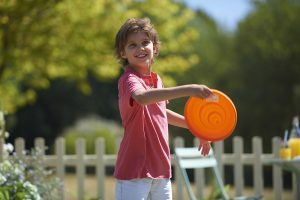 With sun on your side, you can’t beat a game of Frisbee with the family. Or football, tennis, rounders or any other ball game! Gather the whole family for this, it’s perfect for playing in the back garden, in a field while you’re having a picnic, or when you’re abroad on the beach. Buy some water balloons, fill them up with water and tie them, then hand to the kids and let them throw them around! For added competition, get into pairs, throw the water balloon back and forth to each other – moving further apart with each throw. The trick is to keep the balloon from bursting, and the winner is the person who doesn’t get wet! If the kids are fans of Harry Potter and all things magic or even fancy themselves as the next Nutty Professor, then why not let them create their very own potions with their very own lab? This one can get a bit messy, so it’s best done outside. lab coat/white shirt – purely for getting into character! goggles or face mask – for dramatic effect! Using the funnel, add water to the plastic bottles. Then pour in some food colouring of your choice. Add a couple of tea spoons of bicarbonate of soda and then a little splash of vinegar. Let the fizz and bubbles commence! Why not add stardust and paint for added effect? Put the lid on the bottles and label up the ‘potions’. Just remember to tell the kids they’re not for drinking! This is an activity where you need a good bit of wind – the seaside is usually the best bet. 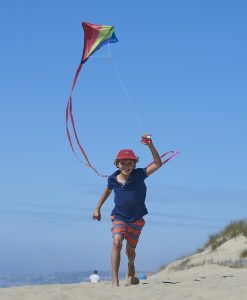 Kids and adults alike love a bit of kite flying. The colours look glorious on a hot summer’s day. Whether embracing a staycation or heading abroad, always be sure to pack the kites. Let the kids get stuck into creating their very own messy mud pie! They can use the spoon for digging up mud, adding in water to make it more pliable. Work the mud into round balls then add flowers and stones for decoration. They may look like chocolate cakes, but they’re not for eating! the desired length, cut to shape and staple the ends together. 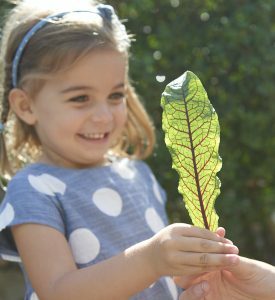 Forage for leaves, berries and flowers – they’ll make perfect jewels and decorations. These can be stapled and taped on with sticky tape. What’s better than drawing in the great outdoors? There’s no need for paper and paint with this, just use the pavement and chalk! If the kids want to restart their drawing, simply get them some water and a big paintbrush and let them brush away their old drawing. So if you’re wondering how to entertain the kids during the school holidays, as you can see, it only takes a little bit of imagination…and it doesn’t cost the earth. Don’t forget to share your summer activities with us on Twitter, Facebook or Instagram.